Sunday Worship : 10:30 a.m.
Sunday School for All Ages : 9:00 a.m. If Road Advisory is Level 2 or 3, Worship and Sunday School are Canceled. Every week we gather to remember God’s amazing love for us and to hear and receive Jesus’ forgiveness and peace. 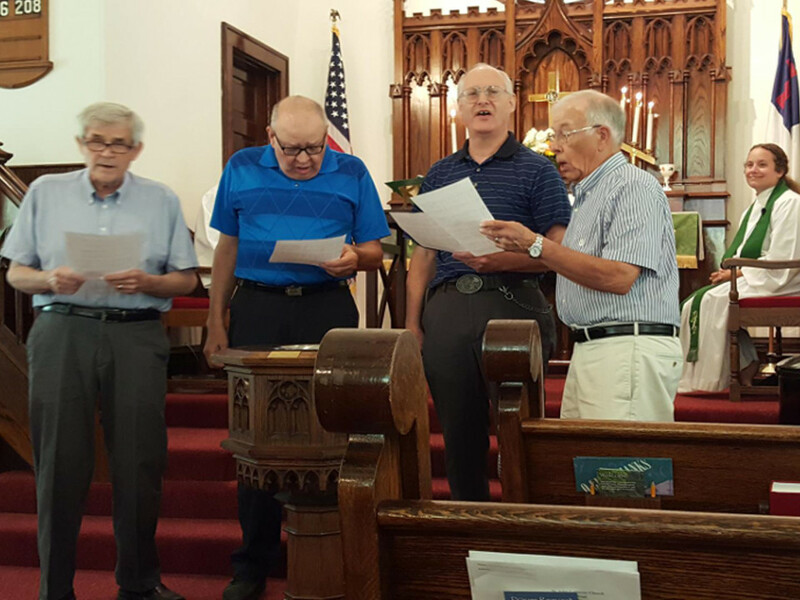 During each worship service, we share together in the wonder of the Good News of Jesus’ life, death, and resurrection through singing, prayer, the reading of scripture, and preaching. On the first and third Sundays we receive the sacrament of Holy Communion. Everyone is welcome at our Lord’s Table. A nursery for young children is provided downstairs in our fellowship hall. Parents, who wish, are invited to take children to the nursery following Youth Time in worship. Sunday School for all ages is at 9:00 a.m. 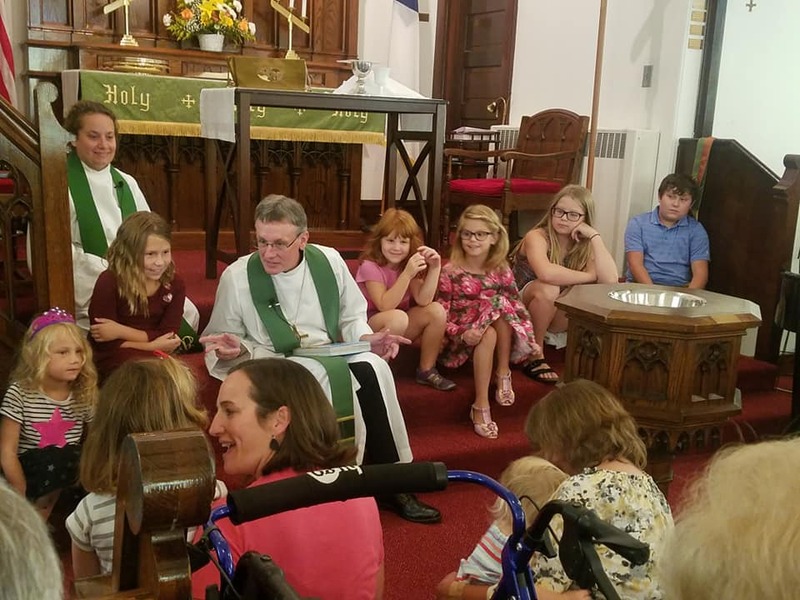 The church is completely accessible to all persons. Parking is available across from the church. Greeters will direct you to the sanctuary and other facilities. Are you interested in learning more about what happens here at Saint John's? Are you interested in becoming a new member? 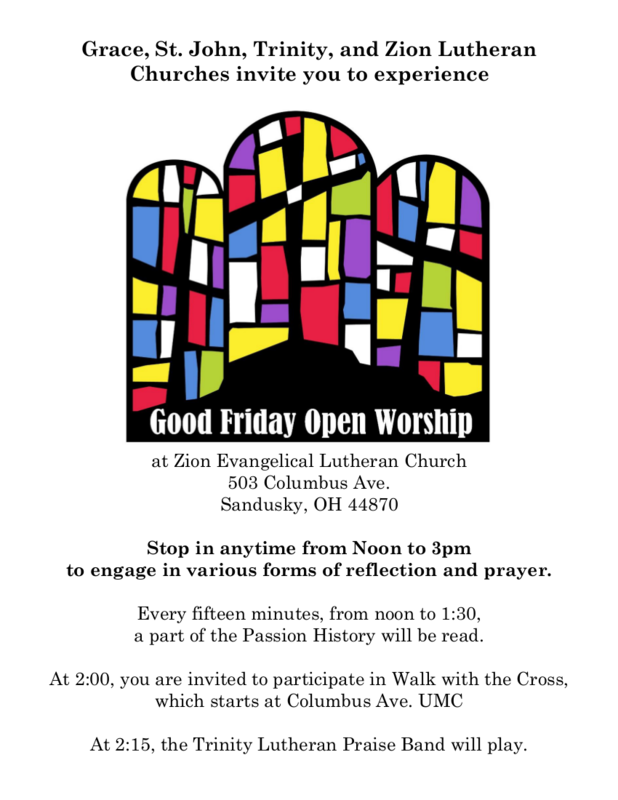 Please contact the church office at 419-625-2192 to begin the conversation. We look forward to your visits. April 28 at 10:30 am. Each Sunday morning there is a bunch of exciting opportunities for learning open to adults, teens and elementary age youth. 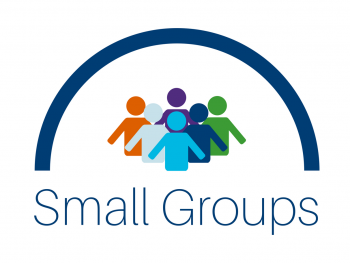 These studies for all of us meet in the Upper Room or the Fellowship Hall each Sunday morning at 9:00 am. Journey through Mark: Join us at Panera Bread on Sunday mornings at 9 am as we journey through the Gospel of Mark. Enjoy some coffee and a bagel as we follow the life of Jesus and share our lifes with one another. Please contact Jason Steckel at 419-602-6288 if you would like more information. All are welcome! Everyone is invited. It is with great joy that we join together to celebrate the sacrament of Holy Baptism at St. John’s. On Sunday, April 14th the baptisms of Hunter William and Holden Allen will take place. Hunter and Holden are the sons of Amanda and Bruce Cantu, grandsons of Rita Vargo Zorn and Tim Zorn and great grandson of Joan Zorn. Please plan to support these children and their families in their new lives of faith. Our Wednesdays in Lent include soup and sandwich supper, prayer, fellowship, discussion, and worship. A sign-up list is on the Welcome Table to provide food for soup suppers. Plan to join us for this special time of worship, food, and fellowship! See list on Welcome Table for needed items in the weeks ahead. Help us fill the water jug! Our Sunday school kids are collecting loose change to build wells for other kids in Tanzania to have clean water. Help us fill the jug with change! We will collect loose change through Lent. Thank you! Maundy Thursday: April 18th Worship at St. John's at 7:00 pm with Celebration of the Lord’s Supper. 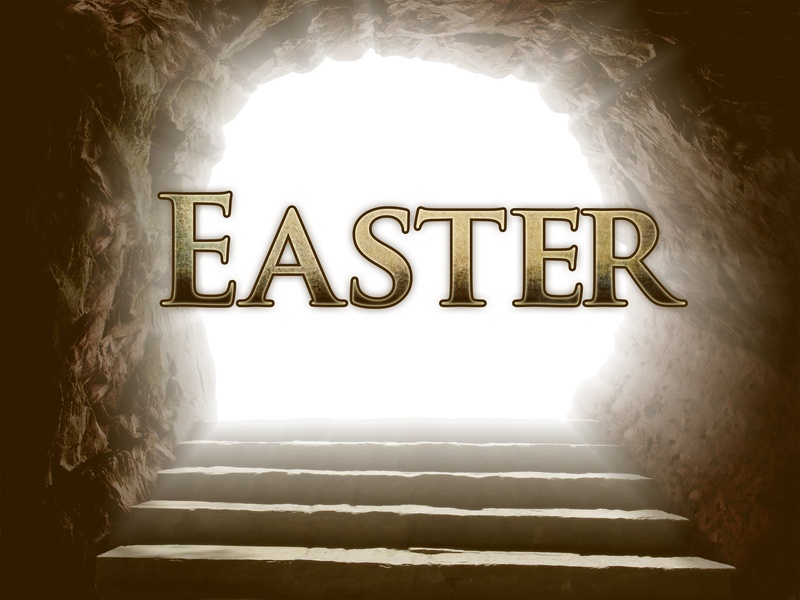 Easter Sunday Worship: April 21st at 8:00 am and 10:30 am. Holy Communion at both services. Easter Egg Hunt for the youth during the breakfast. Join us for all of these special worship opportunities! · Easter Egg Hunt for our youth will be held on Easter morning during the Easter breakfast. If you would like to help with the hunt see Lori or Jenna Stacy. Donations of candy would be much appreciated. Please leave candy in the kitchen and mark for egg hunt. Our “Spring Fling” Supper Club will be on Thursday, April 25th at 6:00 pm at Marconi’s Restaurant in Huron. This will be our last one until Seemember 19th. We have ordered our family style menu again. This was very popular the last time we were there! It would be nice if we can get a good turn-out again! Make your plans to come for a great evening of fellowship and good food. We always have such a good time! Sign-up sheet is on the Welcome Table. Our Book Club Meets Again. We meet at 9 am in the Upper Room. 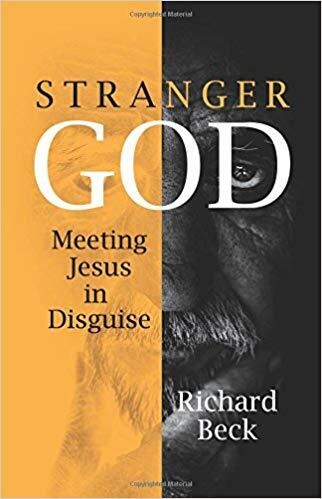 The book is Stranger God. This is a remarkably useful book. Beck lays out the core issues affecting our relationships to people outside of our normal social circles, shows why this is an exceptionally important issue, and gives a great practical way to become more like Jesus. This book would be of value to any Christian who is interested in addressing the various divisions in our world. A nice perk is the simplicity and concise nature of Beck's writing style. His message is accessible and valuable to anyone regardless of educational background, and makes a fabulous small group resource for us. The second Tuesday (April 9) for young families will meet at Chet and Matt’s at 6 PM. You are invited! Join us for pizza buffet, prayer, and conversation. There will not be a young family second Tuesday in May, so join us for the special one this month! We are moving "2nd Tuesday" to April 16th. Second Tuesday will meet at the home of Ron and Melinda Zorn, 1909 Lake Forest Dr., Huron. Please sign up on the welcome table. 1. Day Camp with Zion, Huron is June 17-21. Day Camp for K-6 is 10am to 4pm, Monday-Friday. Day Camp for preschoolers is Monday, Wednesday, Friday from 10am to 12 noon. Registration is available online. Day Camp fills up quickly, so register soon. If you are available to volunteer in the kitchen or with registration, please see Pastor Stacy soon! Information is available online. Check it out! 3. 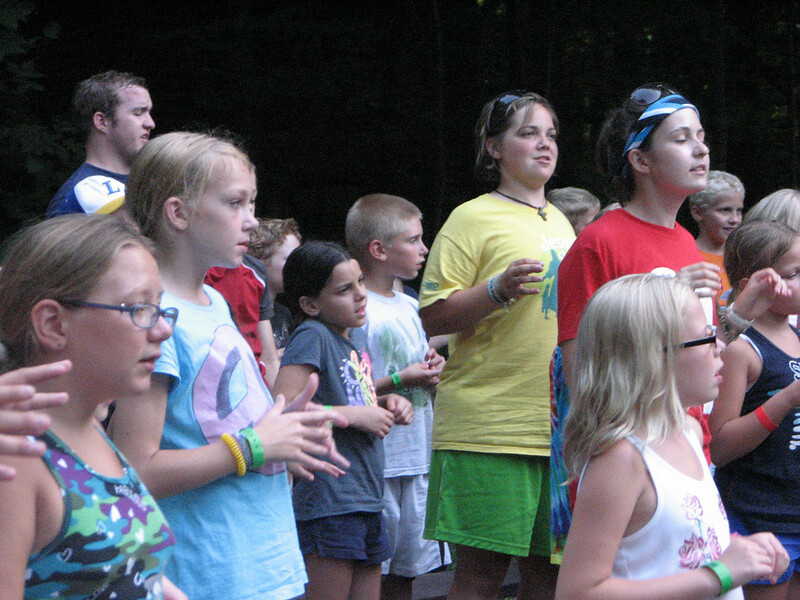 Summer Camp for our elementary age kids is likely the week of July 14-19. Additional information is available at pathfinders. Please let Pastor Stacy know if you are interested in any of these camp opportunities. Scholarships are available, and camp is more fun when we do it together! Eucharistic Ministers: Thank you for the care you give our members who are homebound! We would also like to help care for you. Please make sure your kits are returned by the last Sunday of the month so we can restock, clean, and keep them organized (hopefully giving you a bit less to do). They will then be blessed on the first Sunday of the month during worship and ready for you as you need them. Graduation is fast approaching! Please contact Sandy Thompson with names of our High School, Technical School or College graduates for the May Newsletter. Help us fill the water jug! Our Sunday school kids are collecting loose change to build wells for other kids in Tanzania to have clean water. Help us fill the jug with change! We will collect loose change through Lent. Thank you! Our “Spring Fling” Supper Club will be on Thursday, April 25th at 6:00 pm at Marconi’s Restaurant in Huron. This will be our last one until September 19th. I have ordered our family style menu again. This was very popular the last time we were there! It would be nice if we can get a good turn-out again! Make your plans to come for a great evening of fellowship and good food. We always have such a good time! Sign-up sheet is on the Welcome table. St. John's continues to have an active prayer chain. Would you like to be added to the list of people who pray? Would you like us to pray for you? Please contact Pastor Stacy, Kerry, or Sandy. Happy birthday wishes to Tavilyn Dillender. Owen Reed – has returned home. 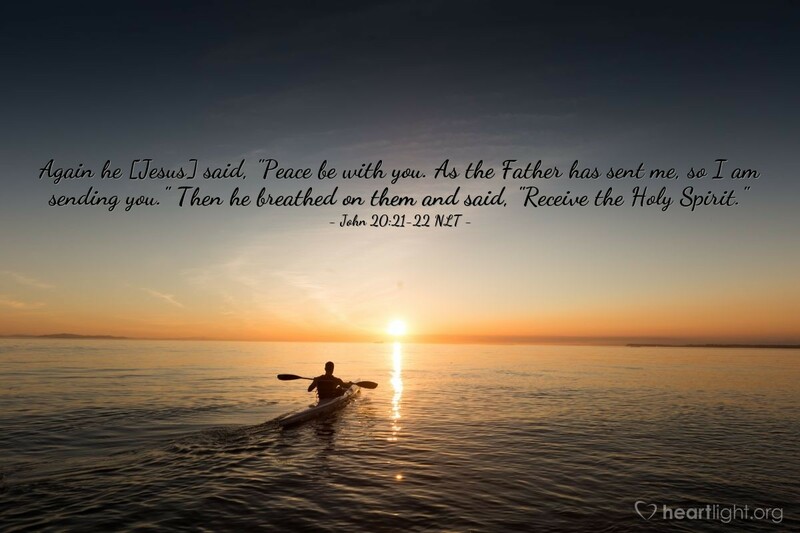 Judy Henry – Prayers for healing and recovery from hip replacement surgery. Prayers for the family of Dale Osbun, in the loss of his mother, Rachel Osbun. 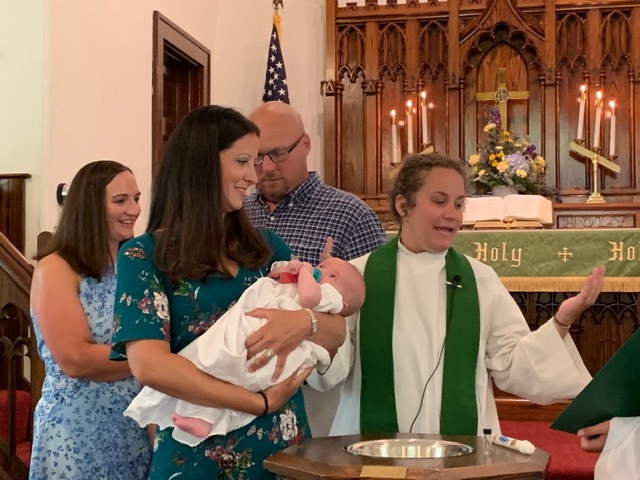 Council prayer requests: Council asks for prayers and guidance for our third Seminarian, Kriss Buss, for balancing her family, work and education. Identity of Jesus Examined at Lifetree Café. The program titled, “Who Was Jesus – Really?” features a filmed interview with Greg Stier, author of Outbreak and Rick Lawrence, author of The Jesus-Centered Life. Both men share their insights about the historical Jesus and what influenced their conclusions about the identity of Jesus. Participants will have the opportunity to share their own thoughts concerning the identity of Jesus. Admission to the 60-minute gathering is free and everyone is welcome. Lifetree Café is a place where people gather for conversation about life and faith in a casual, comfortable setting. For information, call 419-433-4955. 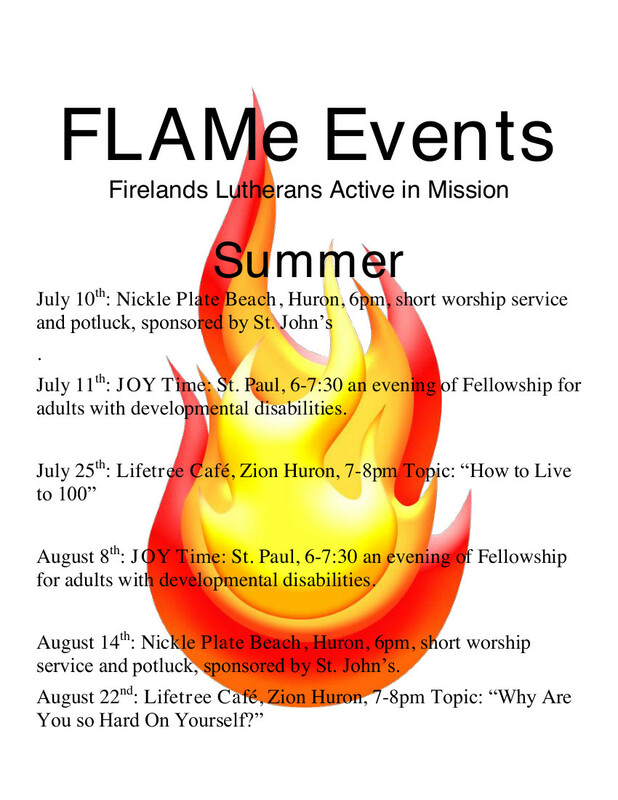 Sponsored by FLAMe-Firelands Lutherans Active in Mission. Thank you to everyone who is assisting with worship this Easter morning and during Holy week services. Your willingness to serve is a blessing to the members of St. John’s. We thank Brandon Alt, the choir and Morgan Noon for blessing us with their musical offerings. Easter Breakfast! Special thanks to Bob Stacy and the men of St. John’s for preparing another delicious Easter breakfast. What a wonderful time of good food and fellowship! Easter Egg Hunt! Special thanks to Lori and Jenna Stacy for preparing the Easter egg hunt for our youth, and to all who donated candy. Holy Communion: Our youth love the gift of Holy Communion – the grace, love and forgiveness that comes to us in the amazing gift of Christ’s body and blood. They have once again requested that we have Holy Communion every week during the season of Easter, which goes until Pentecost on June 9. The 1st Sunday of the month will be full communion with bread and small cups. The remaining Sundays of the month communion will be by intinction. We give thanks to our Lord Jesus for the love he continually gives to us in this amazing sacrament. Thrivent: Are you a Thrivent member? Do you have ideas for a service project or fundraiser (even if you aren’t a Thrivent member?) Thrivent has money available to help us serve and share the good news! Please join us at 6:00 pm on June 4th to find out how we can help get these grants. A Thrivent rep will be here to answer all our questions. Scholarship Fund: We will begin raising funds for the St. John’s scholarship fund beginning in May. 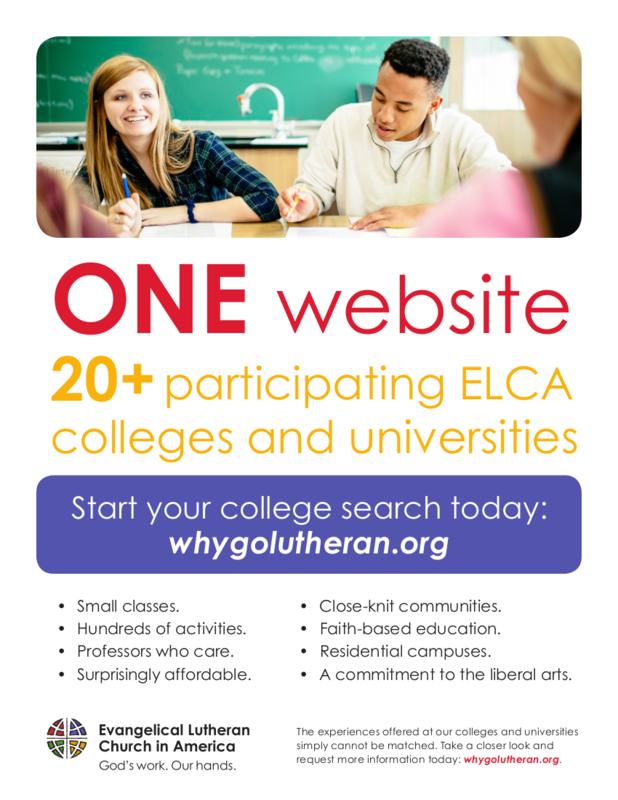 The fund benefits college and seminary students from this congregation, but we need your help to ensure that scholarships will continue to be available. 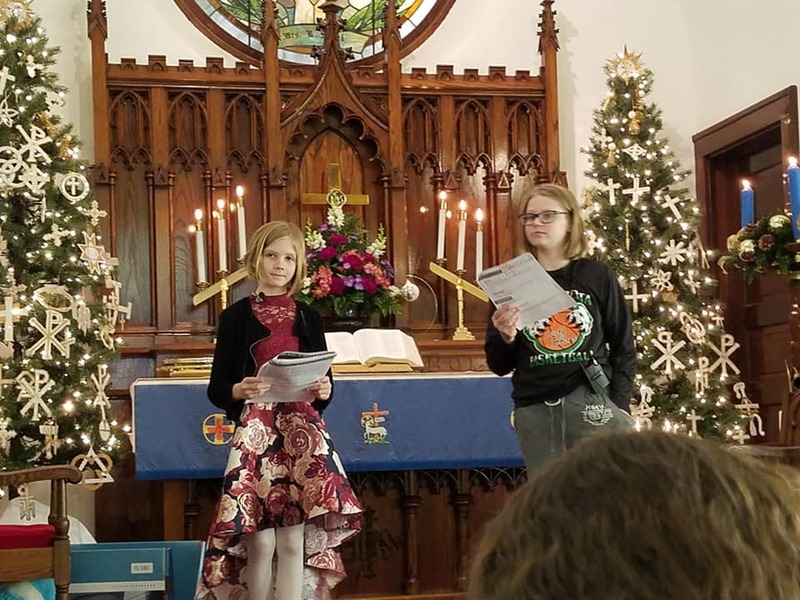 To contribute, you may place a check made out to St. John’s Lutheran Church, with scholarship fund on the memo line, in the offering plate or in scholarship envelopes placed on the welcome table in the back of the church. Please give prayerful thought to helping with this special ministry at St. John. Giving Garden update: The start of the 2019 garden will take place on May 18th at 9:00 AM. The rain day will be the next Saturday, the 25th, at 9:00 AM. 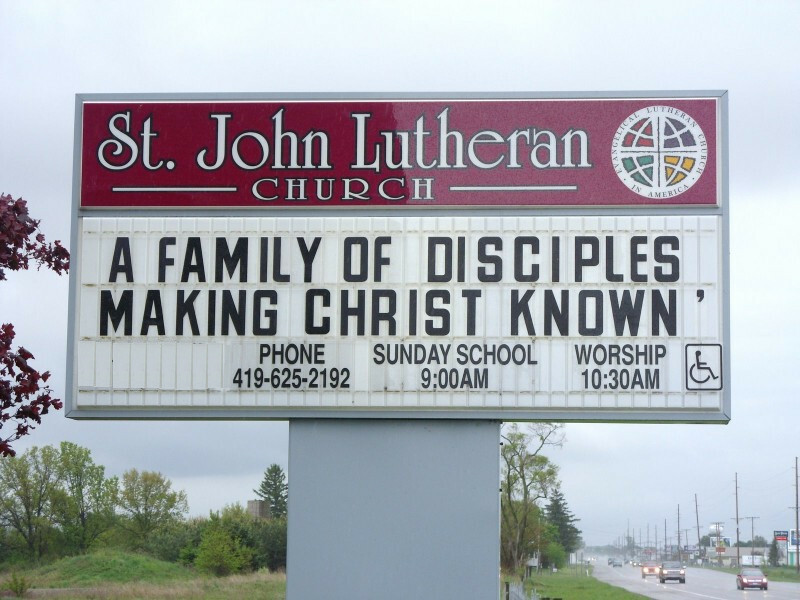 The garden is located on the south side of St. John’s Lutheran on US 250. Peace. Happy Birthday wishes to Allison Young, Kimberly Luman, Laura Knott, Jerrie Krawetski and Paxton Luman. Happy Anniversary to Don and Vicki Johnson. Kathy Strayer in loving memory of Bob Strayer and our parents. Bonny Ambos in loving memory of grandson, Stone. Jim and Bonnie Semon in honor of Corwin, Paxton and Paisley. Chuck and Sandy Thompson in loving memory of Charles and Pearl Thompson, Arden Bruns and Ruth Bruns. Rollie and Myrna Schlessman in loving memory of Janet Schlessman. Amelia and Barbara Bliss in loving memory of family and friends. Chuck and Heather Ruggles in loving memory of Fred and Jane Shinrock, Sharen Smith, Chuck Ruggles III, Fred Hespeler, and Don Smith. In honor of Annabelle Hespeler, Ethel Lois Smith, Barb Ruggles and Ray Smith. Linda and Jim Moore in loving memory of our parents. Dennis and Sue Bottorf in loving memory of our parents. Paul and Laura Knott in loving memory of loved ones. Ray Smith in loving memory of Sharen Smith. Doreen Ross in loving memory of Mark, Mom, Dad, and Dean. Mario, Kathy, JoAnn, Jacque in loving memory of Polly DiCocco and Jack Van Dorn. Doug and Tara Tommas and family in loving memory of Sharen Smith and Fred Hespeler. Chuck and Peg Kingsley in honor of Ruth Knupke. Aileen Wilson in loving memory of husband, Richard Wilson, and in honor of John and Lisa Wilson, son and daughter-in-law. William and Sue Lucht in loving memory of our parents. Norma and Lou Zorn in loving memory of our parents, Albert and Dora Zorn and Carlton and Beatrice Herge. Rita Zorn, Amanda Cantu and boys in loving memory of Andy Varga, Harold Zorn and Mark Cantu, and in honor of Joan Zorn. Jason Steckel in loving memory of Roland and Paula Steckel. Ann and David Voight in loving memory of our parents. Ron and Paula in loving memory of Bob and Barb. Sat, Sep 29th: Trinity, Sandusky, 8:30 am to 1:00 pm. Eastern Conference Women’s Fall Retreat, “Prayer with a Twist”. Thu, Oct 11th: St. Paul, JOY Time, 6:00-7:30 PM, night of faith and fun for adults with developmental disabilities. 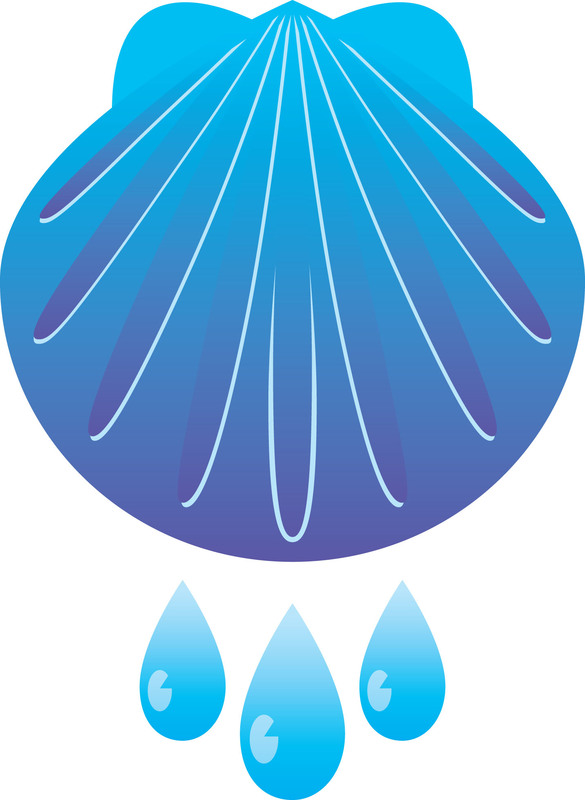 Sun, Oct 28th: Reformation Sunday, FLAMe Covenant Signing at all congregations. Zion, Huron, Lifetree Café 7-8pm. Lifetree Café is a place to gather for conversation about life and faith. JOY Time is cancelled due to March 5th Talent Show. St. John’s, 7pm. FLAMe Board meeting. St. Paul, JOY Time, 6-7:30pm, a night of Christian Fellowship for adults with developmental disabilities. Thursday, April 11th, Practical ways to tell if someone is telling you the truth will be explored at Lifetree Café. The program, titled “How to Spot a Liar: Secrets From a Former FBI Agent,” features an exclusive filmed interview with FBI counterintelligence officer John Schafer. He developed deception-detection techniques that are now widely used by intelligence and law enforcement agencies. In his interview, Schafer shares key indicators that signal when someone is lying. Thursday, April25, The identity of Jesus Examined at Lifetree Café. The program, titled “Who Was Jesus—Really?” features a filmed interview with Greg Stier, author of Outbreak, and Rick Lawrence, author of The Jesus-Centered Life. Both men share their insights about the historical Jesus and what influenced their conclusions about the identity of Jesus. Participants will have the opportunity to share their own thoughts concerning the identity of Jesus. To read or listen to the verses below: click on them. We don't collect or store any personally identifiable information.